Looking for the punchline? So was I. A prior trip to a Munich sauna involved lots of naked Germans. I was neither relaxed nor renewed. 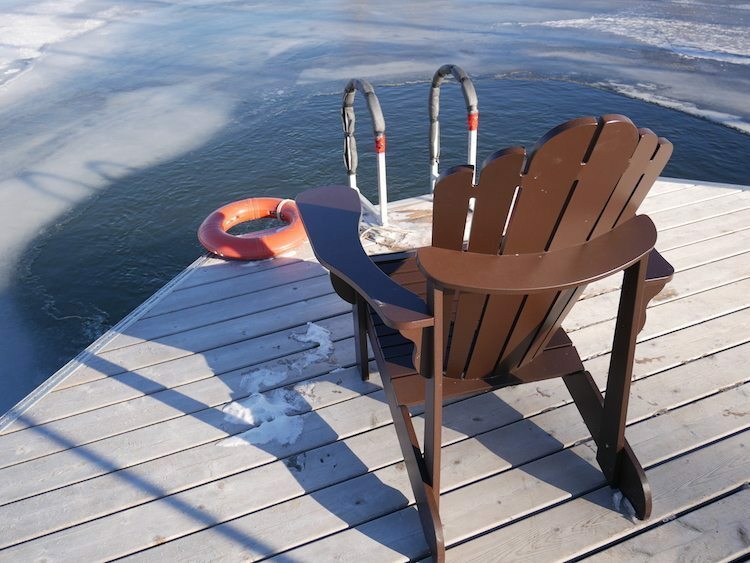 So I approached my visit to a Canadian spa with caution. 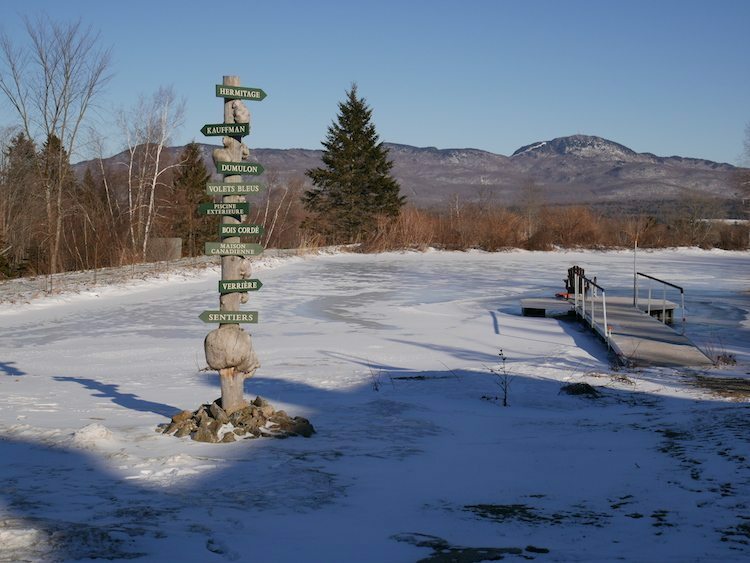 My trip to Spa Eastman in the Quebec’s Eastern Townships, however, was wonderful. Guests wore bathing suits and everyone obeyed the “Silence, please” signs and I didn’t know that Hawaiian and Japanese massage techniques, when combined, can make all of those aching neck and back issues disappear! Possibly the biggest surprise of all was that someone developed recipes that are dairy- and gluten-free and taste like food, not cardboard! My full article’s on TravelingMom, but here are some of my favorite outtake moments. As I was getting ready for dinner, there was a knock on my door. Two young ladies were pulling a trolley. “Would you like a hot water bottle?” they asked. I debated for a second and, since I couldn’t come up with a downside, I took the proffered bottle. I snuggled up with it while reading and it felt wonderful. Note to self. 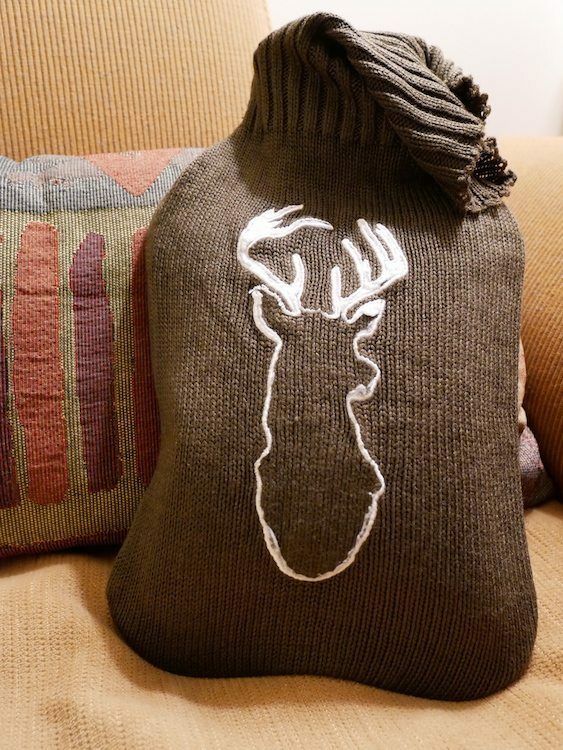 Buy a hot water bottle. 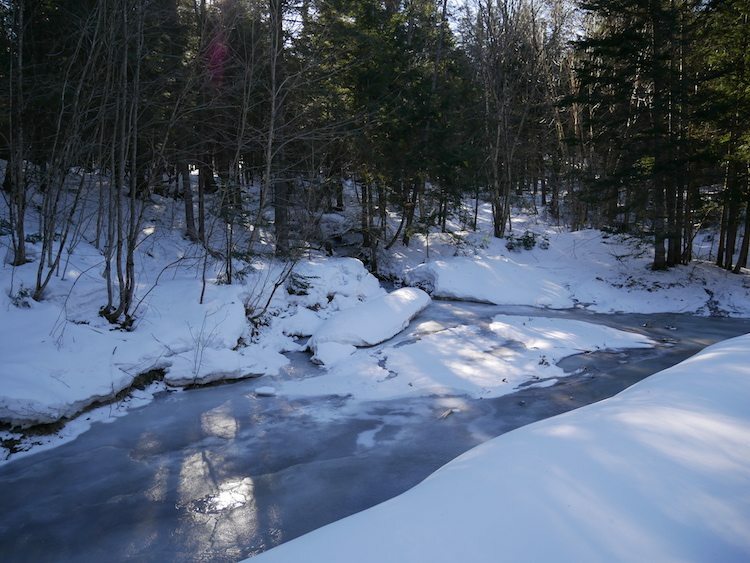 Spa Eastman has 15 kilometers of trails to explore. Although the temperature during my visit was waaaaay below zero, I had plenty of long underwear, a fleece, ski socks, and boots to brave the great outdoors. Wandering through the woods in silence was almost as relaxing as my massage. Spa Eastman touts the benefit of alternating hot and cold treatments. So I spent some time sweating in saunas and then plunging myself into polar pools. An exterior option was available. The resort keeps a hole open in the lake outside. I took a hard pass on that one. When you go to a destination resort, the point is to stay on campus and enjoy the property. That violates my exploratory nature. So I had to push back my departure time to do a quick expedition in the surrounding area. Leaving Spa Eastman’s property, I pulled over almost immediately. A charming wooden cross stood at the intersection of two roads. 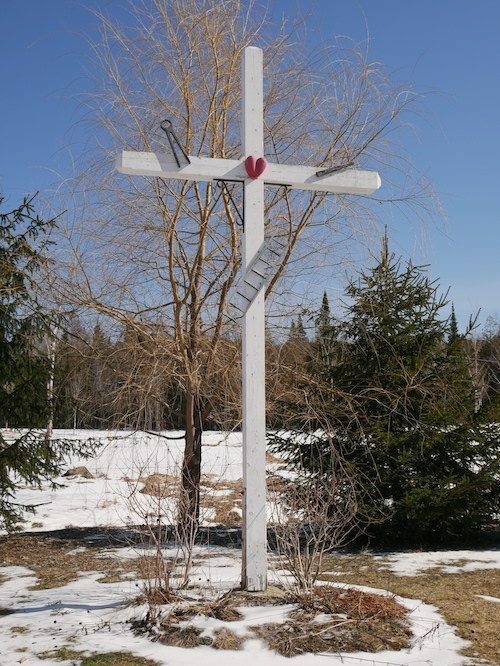 It’s one of many wayside crosses in Quebec. Erected by the originally settlers as a communal spot to gather and pray, they’re presently maintained as an historical nod to the past. My next stop was at a roadside stand to purchase large cans of sirop d’érable, better known as maple syrup or Elf’s favorite condiment. If you visit me this year, you’re getting pancakes. Then, I pulled over because I saw a familiar sign. 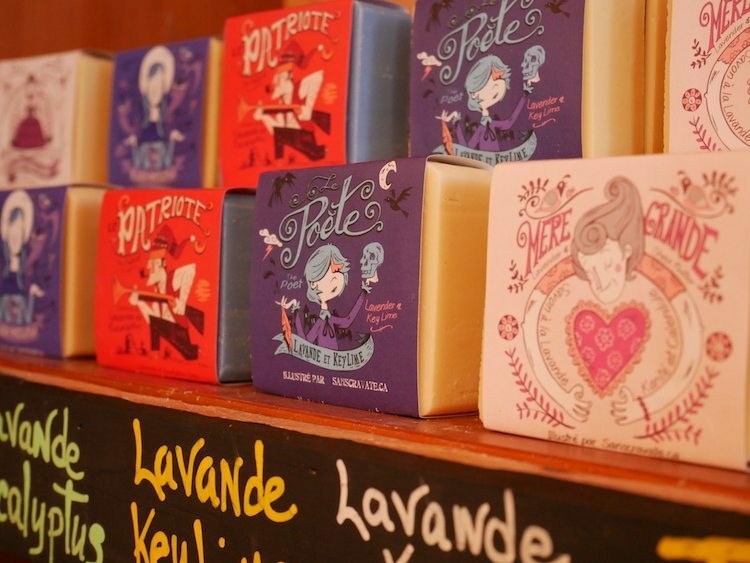 Spa Eastman’s gift shop features many local products including some terrific smelling soaps with adorable packaging. I recognized the name of the company, Savonnerie des Diligences, and pulled into the driveway, nearly colliding with the owner, Marie-Eve Lejour, as she was leaving. She encouraged me to go inside and visit the store and workshop where I was welcomed by Caroline. The soaps are assigned unique characters with legends attached to them that reflect their formula. For example, Madame Tignasse graces one bar, recommended for use as shampoo. She’s a redhead with a glorious mane that serves as a bathrobe after her morning baths in a lake. I bought a carful of soap and wondered if I’d make it through border patrol. It was getting late and I had a 6-hour drive ahead of me, but I had one more stop to make. During my Scotland trip, I kept seeing pictures of weird red-headed mammals. 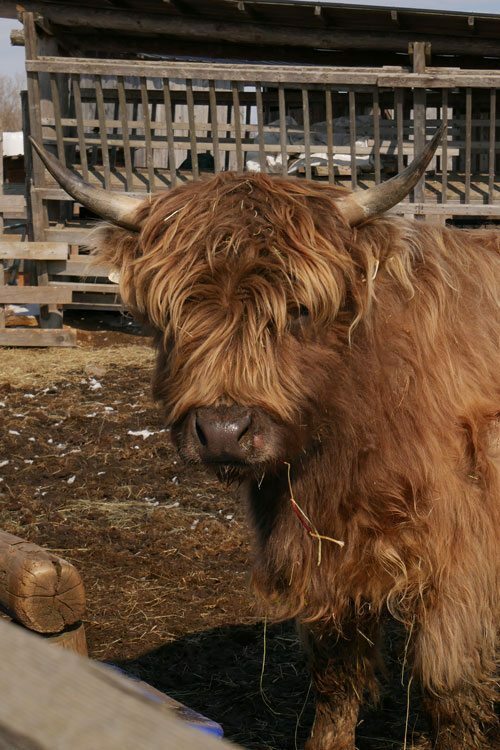 I thought they were some kind of indigenous yak, but later learned that they’re a cow, a Highland cow. A quick Google search returned the name of a farm with Highland cattle not too far off my route. So I had to go. The sign at Ferme au Pied Levé said “Ouvert” – I know that means open, so down the driveway I went. I knocked on a few doors and was greeted by owner Denis and his friendly dogs. Denis showed me around the farmhouse which he and his family operate as a holiday rental and his son William introduced me to the animals, including the herd of Highland cattle. I didn’t find the cheese until I stopped hours later for gas. My Subaru needed a car wash intervention. « Spring Break Planners: Are You an Early Bird or a Late Bloomer?